The Keyboard Company's Numeric Keypad lets hard-working professionals enter numbers, carry out arithmetic operations and input VisiCalcTM commands quickly and easily. The keypad, clearly coordinated with the Apple computer in both color and design, increases operator efficiency by concentrating essential keys in a familiar format, and allowing the operator to place the keypad in a comfortable position. 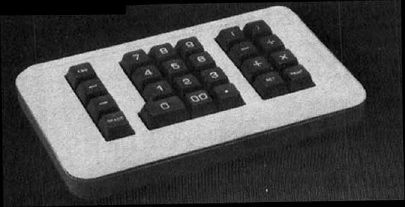 In addition to the standard keypad with double zero and decimal point, The Keyboard Company's product has a full set of operator keys, complete with parenthesis, print, return and four basic arithmetic functions. The VisiCalc section of the keypad uses three keys to control cursor movement. Two keys control the directional movement, and depressing the third key will change the cursor horizontal movement to vertical. Holding down either directional movement key initiates the auto-repeat mode, which moves the cursor across the screen until the key is released. A fourth key deletes entries. The keypad, complete with interface board, cord and directions, is available in Apple dealerships nationwide for $149.95.